If you asked me what my idea of heaven is I would say it was here, at this point in time. Far far away from any mad rushing crowd, noise pollution, light pollution, traffic, people, internet...okay, I had to go looking for internet, but other than that the only noise pollution here are roosters and wind against palm trees flapping outside our beach hut, and the waves crashing on the reef out there - all the way out there. The stars shine brighter here, and the moon casts such a wonderful glow on the beach in the middle of the night. I'm lying here in the hammock at 21:00, with the sea breeze through my hair, the rustling of the trees and the chirping of crickets filling my consciousness. It is a heavy wind tonight, which is a good thing otherwise the Mosquitos would be disturbing me and I wouldn't be out here. So we've been here a few days, and you know what they say about island time...it's true, life moves slowly, and you forget what time it is, what day it is. All you know is that when the sun rises there is a lovely glow on the deserted beach. When the sun sets you get a glorious show as well. The beach is still and quiet. That is Mathias' sailboat - he's the owner/host/tour guide operator/Mr One Man Band. Kien even refers to him as The Man - as in "The Man has got tools". He put the sail together so we could all use the boat, and Jef has been out on it a couple of times. There has hardly been any wind, so it took him ages to get anywhere. But hey, it's island time - there is nowhere to go except sailing, snorkeling, or lounging around. We are living in huts situated on the sand. It's basically camping with electricity and running water. There is a lovely shaded BBQ area under the trees. Since we've been here Kien's gone rogue, I tell you. He spends most of the time in the sand, on the beach, or in the lagoon. It's difficult to dispose of nappies here, so he's spending most his time here naked - and loving it. The joys of scootering around this quiet island! We sandwich Kien between us on the scooter. He loves that scooter. We went to the markets on Saturday. I was expecting a bustling market full of produce. But no, lots of taro, very little else. But those people stopped and bought themselves a huge box. I'm glad to see the market catering for the locals, and not full of touristy junk made in China. It's rained a few times, but nothing like back home. The rain pours heavily, and then the sun comes out. The water is so clear in the lagoon right in front of our hut that even above water I am able to witness the sea life. 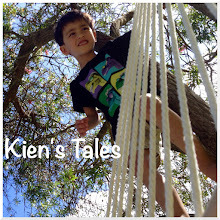 Kien is getting bolder every day with wanting to "swim" - meaning walking deeper unaided. It is late now and everyone is asleep. It has started to rain (I think) - its amazing how similar palm trees rustling in the wind sounds to rain. I shall endeavour to get this post up tomorrow morning when I find a sweet wifi spot on the beach. I know they say money can't buy you happiness, but omg it sure looks awesome being rich! It's gorgeous there, is it warm like summer? Oh, I really enjoyed to read this post and look at the gorgeous photos! Photo number two is so absolutely wonderful. It really does look and sound like paradise. Just lovely, enjoy your holiday! Loved looking at your beautiful photos, you have a great 'eye'. @ Michelle, yes it really was warm - anywhere between 20-25 degrees. @ Jessica, thanks. Jef actually took that photo. He captured such an amazing moment. @ Kirsten and Greg, so lovely to meet you both. It definitely is hard being back in the cold! I hope you see this message and come back to this blog so you pick up the photos of our fun times at camp! Please send us your email address so we can ping you.